While this duo may not sound immediately familiar, both have an excellent track record. Joseph Williams was the voice of Toto for several years in the 1980s and is now back in Toto as their current vocalist. As well as his time in Toto he has been a backing singer for Chicago and worked as a session vocalist, but where many non Toto fans will have heard his voice is in the Disney movie, The Lion King where he was the singing voice of the adult Simba. Peter Friestedt is a Swedish guitarist/songwriter who has worked with the likes of Chicago and Steve Lukathor as well as having released two critically acclaimed albums (LA project and LA project II). 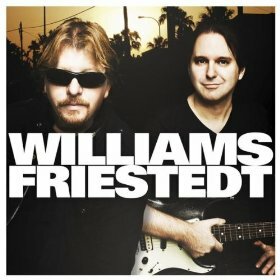 With two talented members, Williams Friestedt sounds promising, but will it live up to expectations when you listen to it? The simple answer is yes it does..
Joseph Williams provides great vocals to complement the excellent songs. This is an album you can listen to again and again - its a really good album to chill out to. For me, the best track is the opening song - "Swear your love", which would sound at home on a Toto album. The rest of the album as a more laid back feel and is consistently high quality throughout. Definitely an album best listened to in its entirety rather than picking the odd track out here and there. A disappointment was the short running time of the album - a fraction over 32 minutes. They are by no means the only offenders in this respect - several albums recently that I've listened to have been disappointingly short. It's a shame as you feel shortchanged by albums this short and with only 9 songs.